Fundra is a dynamic fundraising app that assists nonprofit organizations in building trust with donors and in increasing donations. 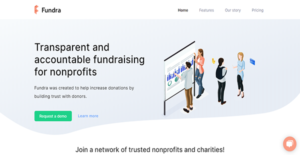 It can help you engage your supporters through branded and mobile-friendly fundraising P2P pages as well as gather donor information for future use. This way, you can get back to your supporters and show them the impact they made in your programs. Fundra also enables you to create programs and projects within its interface and manage them from the same place. As a result, you can reach a wider audience with a single click of a button. This allows you to gain more potential supporters who can spread the word about your organization, too. Fundra lets you create branded and mobile-friendly fundraising pages that can gather relevant information from donors. This lets you utilize their data for future efforts so you can tap them for support. Moreover, you can use their information in engaging them to show your gratitude for their help. Many fundraising apps do not provide information to donors where their financial support goes. With Fundra, your organization can be transparent to your donors and show them how their money is being utilized. This also gives donors the confidence to give to your program because of the building of trust. Fundra allows you to manage all your fundraising efforts from a single dashboard. Because of this, you can also market them easily on social media platforms like Facebook and Twitter. As such, you can reach a wider audience with little effort. Apart from this, each of your campaigns has its unique URL. This lets your supporters copy and paste the link to their social media accounts to inspire their connections to give to your organization. What Problems Will Fundra Solve? One thing that keeps donors engaged is showing them how you are using their money. Fundra helps you in this regard by providing you with beautiful visualizations that enables you to articulate and communicate your efforts. When you share these with your supporters, you can convince them to give again and even make larger, repeated donations. If you are interested in Fundra it may also be sensible to check out other subcategories of Best Fundraising Software collected in our database of SaaS software reviews. Enterprises have unique needs and requirements and no software solution can be ideal in such a situation. It is futile to try to find a perfect off-the-shelf software system that fulfills all your business requirements. The smart thing to do would be to adapt the application for your special needs, worker skill levels, budget, and other aspects. For these reasons, do not rush and invest in well-publicized popular applications. Though these may be widely used, they may not be the best fit for your particular needs. Do your research, look into each short-listed application in detail, read a few Fundra reviews, call the maker for explanations, and finally settle for the app that offers what you need. How Much Does Fundra Cost? Fundra is an app that can help you maximize your fundraising potentials. If you are interested in it, you can request enterprise pricing information by filling up the website form. We realize that when you make a decision to buy Fundraising Software it’s important not only to see how experts evaluate it in their reviews, but also to find out if the real people and companies that buy it are actually satisfied with the product. That’s why we’ve created our behavior-based Customer Satisfaction Algorithm™ that gathers customer reviews, comments and Fundra reviews across a wide range of social media sites. The data is then presented in an easy to digest form showing how many people had positive and negative experience with Fundra. With that information at hand you should be equipped to make an informed buying decision that you won’t regret. What are Fundra pricing details? What integrations are available for Fundra? Fundra does not have integrated solutions at the moment but is working on connecting with Double the Donation. If you need more information about Fundra or you simply have a question let us know what you need and we’ll forward your request directly to the vendor.